G4K Famous Artist Escape is another point & click escape game developed by Games4King. A famous artist lived in a beautiful and prominent country. That painter was very erudite and lived up to all of his pieces of art. One day, the famous artist got unexpectedly stuck in a room of his house. Your duty is to rescue that acclaimed artisan. It will help you to find the hidden clues in the form of colours and numbers and to locate the items in the environment to save him. 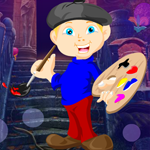 Find them all and solve all puzzles to free the famous artist. Good luck and have fun!
? you just have to go right, and then down, left, up, right again, and up and you're out. For the line/star puzzle. Don't click the stars, drag a line around. atvcountry - you need to click on starting place, but hold & drag mouse to draw the lines. Thanks! that was the hint I needed!